If you are having trouble accessing NMSU e-mail from my.nmsu.edu, these instructions can be used to troubleshoot common e-mail problems. 1. The e-mail button in myNMSU allows you single-sign-on access to your Microsoft Office 365 e-mail. Occasionally, there will be a problem with the e-mail link from myNMSU. If you are having trouble with the link, we recommend you visit http://mail.nmsu.edu/ to sign in to your e-mail. 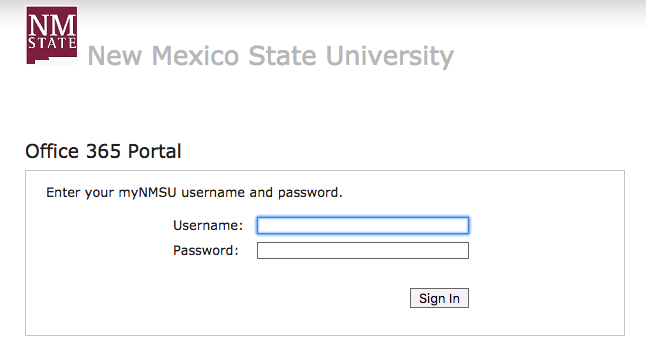 This is a secure sign-in page for your NMSU Microsoft account. 2. At the http://mail.nmsu.edu/, type in your NMSU Username in the Username box. 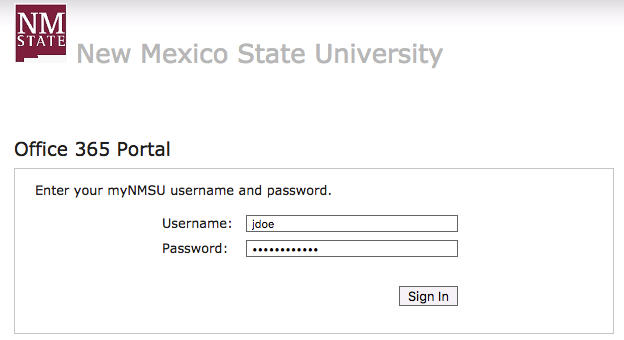 Type in your NMSU password in the Password box. Then click Sign in. If you are having trouble accessing your NMSU email through an email program, refer to the Troubleshooting NMSU E-mail. If you are having trouble accessing your NMSU email on a mobile device, refer to the Troubleshooting NMSU Email on Mobile Devices.